To become a gladiator was not typically something you wanted to enter into without training, and for this purpose specific gladiator training schools were created. 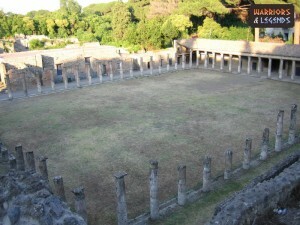 The gladiator training schools known as a ludus, or a ludi in plural were home to all manner of characters. The gladiators who didn’t have a choice were simply slaves sold or passed to the ludus, but you could also voluntarily join if you had the necessary qualities, guts and determinations. The schools were typically owner and run by the manager, also known in Roman times as the munerarius or editor. These owners of the ludus were often well regarded people, and for them the business of a training school could be a very profitable investment. In these schools known as a ludus a gladiator learned not just to be a wild brute who was thrown to the wolves or tigers. Instead they would learn to be a well trained and skillful fighter, and in ancient Rome, this tradition was well formed. The various schools were famed for their strict training regimes, run by house masters also known as the lanista, and just in Rome itself there was four separate training schools for gladiators. another section of the Ludus Magnus in Rome, a massive gladiator training school. The first training school documented was that of Aurelius Scauras, who in 105 BCE created a training school at Capua. It’s goal was to train legionnaires to fight for the public, essentially the very first Roman gladiators. As we mentioned earlier, the two types of students were slaves known as the condemned or volunteers, and both had very different paths to entry. For a slave the entry to the ludus was not optional and mean’t you had only one choice, to fight or die. It’s thought that slaves were typically marked with a tattoo which was common practise in ancient Rome. You could volunteer at a gladiator school if you desired, but there were rules to follow too. Before being accepted you would have to have a magistrate to grant you permission, after which you would be inspected for your physical health, fighting in the Colosseum was not for all. It was even common for people in debt to sign up with a gladiator school, if healthy and strong they had the opportunity to have their debt paid by the lanista of their school. 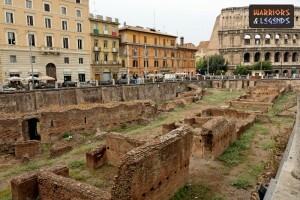 A gladiator training school known as a ludus that still exists in Rome today. As a gladiator it was typical to learn to fight under the style of one class of gladiator, whether it be murmillo or retarius, but typically gladiators physically and skills were matched to the most suitable class for them. A short and well built fighter might be matched with a heavier armoured gladiator class for example, their build making it easier to bear the weight of the armour. In training accident did of course happen, but it was common to minimise these accident by using blunt or wooden replica weapons. By minimising accidents or injuries in training, the gladiators could fight more frequently and popular fighters could be sure they would make it to the amphitheatre in the best health possible, thus maximising their chance of survival and fame. It was common for training schools to be self enclosed areas, with everything the gladiator would need to become adapt at the art of combat. This however did not mean luxury, as the schools goal was to grow and train successful fighters. This also mean’t by the same token, that in many ways a gladiator training school was something akin to a prison. The gladiators that lived and trained here unless very successful were still slaves, and really built to make money for the owners and lanisters of the ludi. As a gladiator progressed in their training they actually advanced through a series of levels making it clear what stage they were at. The grades were called ‘Palus’ and the highest attainable grade in this was ‘Prime Palus’. At the stage of Prime Palus a gladiator should be an enormous asset to his ludus, able to teach and pass on his knowledge and wisdom. Even though the gladiators were essentially slaves, they had the potential to earn their masters, the munerarius a lot of wealth. With this in mind, they were fairly well looked after in most areas and this included their dietary requirements. It was common for gladiators to receive a regular three meals a day, although successful gladiators were probably allowed many treats. The diet of a gladiator is actually thought to be highly vegetarian focused, with emphasis given to providing them with a filling and energy laden boost at every meal. This mean’t their diet was high in fruits, nuts, beans and barley, which would all help make sure they had the fuel necessary for a full and demanding days training. It’s thought to be quite common that gladiators, despite doing a lot of training and essentially being athletes of their time, were often a little chubby or at least had some extra padding on them. This extra weight from their diet had many benefits, from extra energy reserves to assisting in protecting them from strikes and also purported to have helped in their healing. After Spartacus and his fellow gladiators and slaves escaped and revolted, the government and emperor or Rome decided that it was not safe to have free public owned gladiator schools. Instead they slowly over time accumulated ownership of these schools, ensuring that the chance of a revolt was very low in the future. It was at this stage that the golden era of gladiators was almost over as the government and state sought to regulate and control the sport. In the past this business could have made savvy business men of the time very wealthy. While the gladiator training schools, the ludi this were essentially prisons, it’s thought that the gladiators were treated fairly well. They were essentially the stock of the lanisters, meaning they would do what was necessary to make them successful and potential earners for their business.